Purchase books through your local independent bookseller. Purchase books online through Barnes & Noble. Tricia Bauer was born and grew up in Baltimore. She began writing as a young girl and later studied poetry before turning to fiction writing. Tricia has written for newspapers and magazines, and held editorial and marketing jobs with different children's book publishers. Her stories have appeared in literary journals and anthologies throughout the U.S., and her travel features have been published in The New York Times and International Herald Tribune. Her first book, Working Women and Other Stories, was published in 1995 to critical acclaim. Boondocking was first published in hardcover in 1997, and was selected for the Discover Great New Writers program and named one of Library Journal's Best First Novels. Hollywood & Hardwood, her second novel, was published in the spring of 1999, and Shelterbelt followed in the fall of 2000. 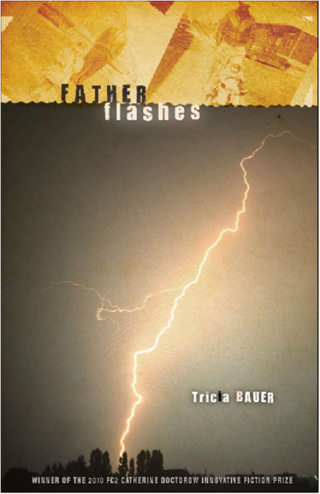 Tricia was awarded the first annual FC2 Catherine Doctorow Innovative Fiction Prize for her novel Father Flashes, which was published in March 2011 by Fiction Collective Two, an imprint of University of Alabama Press. Tricia is vice president of special markets for Rosen Publishing, a children's educational publisher in Manhattan. She lives in Connecticut with her husband, playwright Bill Bozzone, and their daugher Lia.